Date: Saturday 6th April until Tuesday 9th April 2019. Last few Seats Left. Date: Thursday 7th November Until Sunday 10th November 2019. Date: Saturday 11th January until Tuesday 14th January 2020. Date: Wednesday 26th February until Saturday 29th February 2020. 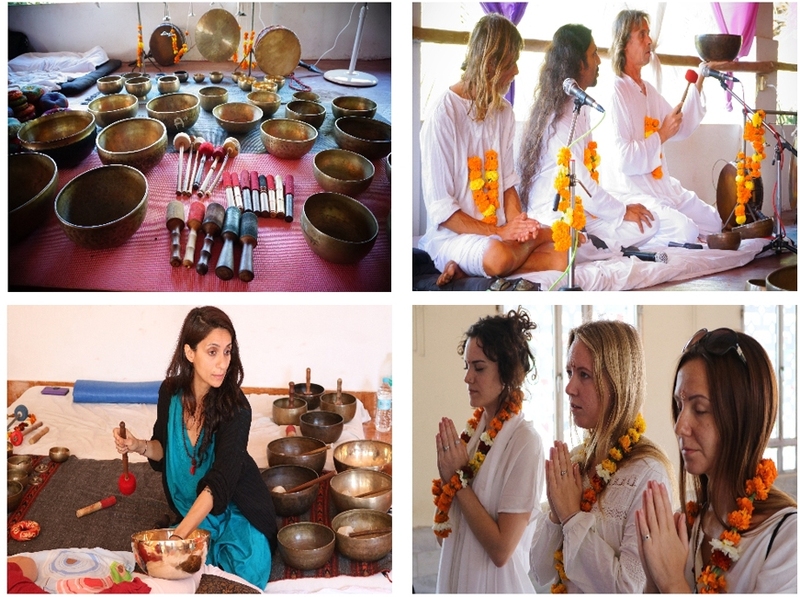 Course Objective: To understand the core principles of Sound Healing and Meditation, get the experience of practicing Sound Healing Meditations and learn to apply the knowledge to conduct Sound healing sessions and workshops. Learn how to lead Tibetan Sound Bowls Therapy, Chakra Healing With Tibetan Singing Bowls and mantra sound healing private sessions. Learn how to design and conduct 1 or 2 days workshops – seminars based on Tibetan Sound Bowls Therapy Sound healing meditations. You are employed as an alternative healing therapist, medical worker, massage therapist, counselor, veterinarian, or any other job that has something to do with healing. If so, it’s possible that you’re be meant to be a healer of some kind. Join us to become an inspiring, time-tested, trusted and effective Sound Healer or a spiritual guide to healing the world on the physical, mental, emotional and spiritual level. 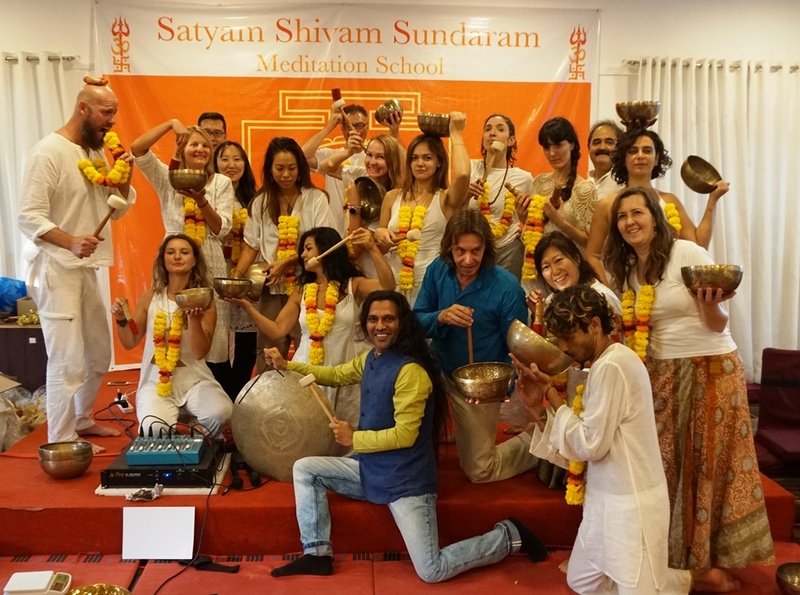 Satyam Shivam Sundaram Offers Tibetan Singing Bowls Sound Healing Teacher Training Course is artfully structured in a way that during the 36 hours sound training program you will not only learn and practice the Tibetan Sound Meditation techniques we inherited from different cultures, but also will understand the principles of Sound Healing, you will be trained in the art of leading various types of sound healing meditation sessions, so that you can guide others by running your own sound healing meditation sessions as well as run 1 or 2 days group sound healing meditation workshops. you are a yoga meditation teacher, tarot reader, Reiki energy healers, alternative therapist, professional, life coach, social worker or a person who wants to perform better in the field you’re already working? Are you looking for a more passionate, meaningful and engaging life? Are you committed to heal and serve others as a guide? You are interested in spiritual practice and natural alternative healing methods which opposed to western medicine. You are looking forward to healing and transforming your life. You have a serious interest in learning and practicing sound healing and have a strong feeling towards sharing your wisdom & experience with other spiritual seekers to heal them. You are prepared to commit wholeheartedly to wake your inner healer. You are ready for life transforming and challenging experience to be improved on physical, mental-emotional level. You are eager to learn from experienced international Sound healing masters and shamans as well as share your wisdom and insights for a cure and heal others. You are a music lover and believe that harmony of sounds can bring the physical, mental peace to peoples’ life. You are looking for a natural unconventional ways to cure physical diseases and mental disorders. Sound Healing Course will get you equipped with tools to improve health without taking any medication and paying hospital bills. Specially if you are a yoga meditation teacher or healer, this training will help you to get your own practice a higher level and enrich it with the techniques you will enjoy. People younger than 18 or older than 65 years. People addicted to alcohol or drugs of any kind. medication to ease these conditions. People suffering from major health conditions. People recovering from surgeries or serious health problems. People with chronically suffering from high or low blood pressure. People who are having arthritis spondylosis or anybody who can’t sit on floor for hours, who cant dance walk move body free and handle activity for 8 to 10 hours. Psychic Medium healers are welcome to join training – but those like to who channel energies & angels during meditation are not allowed to apply for this training. Meditation might bring out suppressed emotions, past traumatic experiences, feelings of guilt, sadness, etc. This is a part of the transformational process. If you are not yet ready to face these problems, it is not the time for you to apply for the course. Meditation practice uncovers the true self in its purest form, if you are not ready to accept yourself as you are, please apply for the course later, when you are emotionally and mentally prepared. Alternative healers, yoga meditation teachers, tarot reader, Reiki Healers, Doctors. Life Coach, Therapists, Holistic health practitioners, and all other light healing workers. You have a strong desire to make this planet, and the beings who inhabit it, a better place. You believe that you have purpose in life is to guide others on their spiritual journey and help them heal to live a happy life in harmony with the world. Are you attracted to the concept of being a healer or light worker? And believe they have a calling is to help people who need healing on the planet. You understand the great importance of the shift in the human consciousness towards awareness and peace and wish to contribute to it spreading love and light. you are a Loving, caring, open and compassionate person to whom friends or strangers alike turn for comfort and advice when life gets hard. Our Sound Healing Therapy Training teach you how to use Tibetan Sound Bowls Therapy & Sacred Mantra Meditation techniques to create a therapeutic benefit at physical, mental, emotional, energetic and spiritual level. And train you in the art of leading various types of sound healing meditation sessions, so that you can guide others by running your own sound healing meditation sessions, as well as 1 or 2 days, sound healing meditation workshops. You will learn the fundamentals of Tibetan sound healing, vibrational sound healing, types & history of Tibetan singing bowls and also the background & importance of Tibetan Singing Bowls in the field of sound healing therapy. You will learn how to play the various types of Tibetan singing bowls and how the different types of bowls have different benefits on the mind, body and spirit. You will learn the different techniques for giving sound & vibration healing with the Tibetan singing bowls. (For example – striking, rubbing, rotating half moon, full moon, creating gaps between each sound, singing with singing bowls and using water with singing bowls). You will learn how to create sounds & vibration in each of the Seven Chakras using the Tibetan Singing Bowls. Example Root chakra keynote is C and frequency: 256 Hz. and Heart chakra keynote: F, frequency: 341. 3 Hz. You will learn how to give a Full Body Therapeutic Sound Bath Healing Session with just a few bowls or with all seven chakra Tibetan singing bowls. You will learn how to give 2-hour sessions of sound & vibration healing, using various techniques such as body contact and sound baths. You will learn how to work with both small and large groups making them more relaxed and receptive by combining sound healing meditation techniques in order to lead them into Group Sound Healing Concert. You will learn how to combine Tibetan singing bowl healing therapy with Yoga Pranamaya, Meditation and other alternative healing modalities. Learn the foundations for giving a session from the Sound healing masters. Learn traditional sound healing techniques in order to determine the most effective duration of your sessions. You will learn how to overcome various obstacles and distractions about sound healing sessions. You will learn how to combine mantra sound Meditations with Tibetan Singing Bowls to give deep therapeutic healing sessions. You will learn how to direct more attention for healing a specific body part in order to work with clients on an energetic level, targeting specific chakras. You will learn how to Improve your communication skills and intuition to become an insightful sound healer in order to guide spiritual seekers on their way to health and well-being. Limited Seat Available – Write us mail to check availability for upcoming training – Apply For Availability. A certificate of completion that acknowledges your commitment, skill and qualification to teach Tibetan Singing Bowls Therapy – Sound Healing meditation sessions and workshops. Able to handle and customize varies sound healing sessions different to various audiences. Gain knowledge and experience in guiding group and private sound healing meditation sessions. Get a deeper understanding and acceptance of yourself and a chance to change the direction of your personal life. The experience of different sound healing meditation techniques and understanding of their application. Achieve personal well-being, clarity, positive attitude and peace of mind. Increase self-confidence, inner creativity, and an entrepreneurial spirit. An understanding of the fundamental principles of sound healing meditation practices from Eastern and Western Masters. You will be able to lead Tibetan Sound Bowls Therapy, Chakra Healing With Tibetan Singing Bowls and mantra sound healing private sessions. You will able to design and conduct 1 or 2 days workshops – seminars based on Tibetan Sound Bowls Therapy Sound healing meditations. 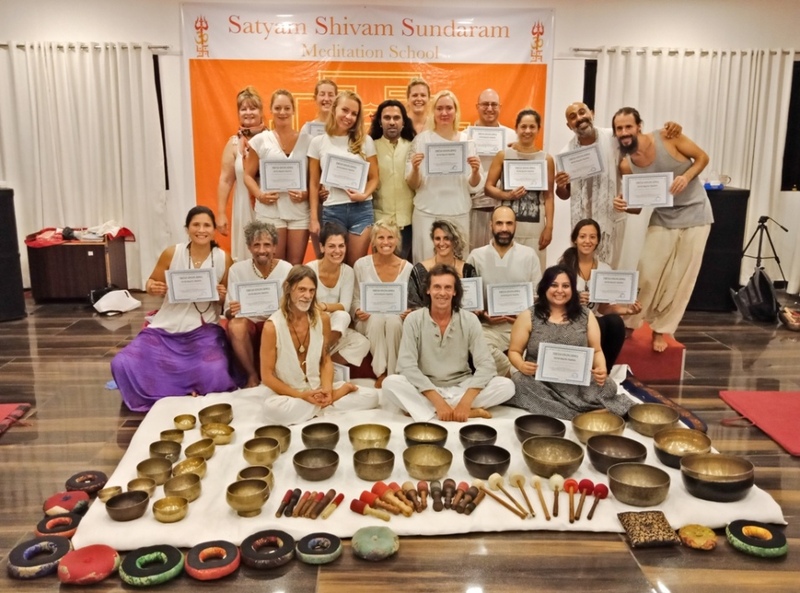 Requirements: To receive a Satyam Shivam Sundaram With Samaveda – International Academy of Sacred Sound Healing Teacher Certificate all the students are required to attend 100% of theory and practical sessions and to pass practical and theoretical exams to ensure the training material has been mastered. 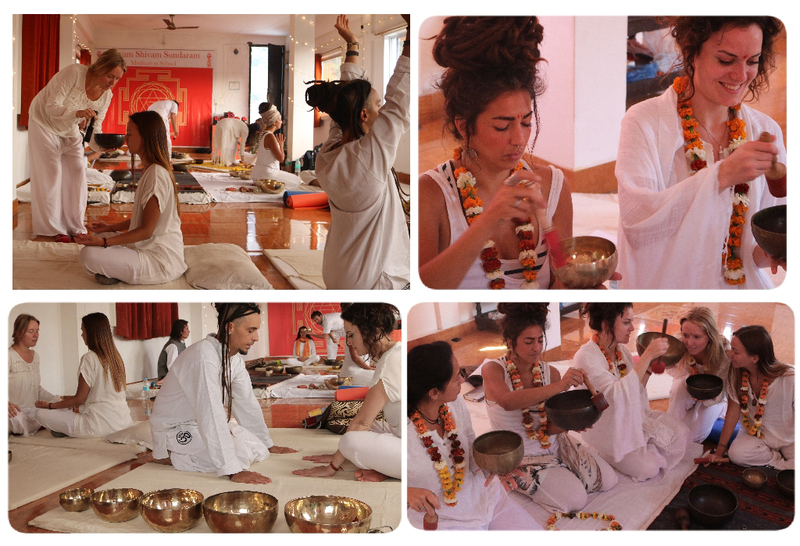 Accreditation: Samaveda – International Academy of Sacred Sound Healing. Certificate issuer recognized: Internationally. Suitability: Suitable for everyone with no yoga meditation healing experience. 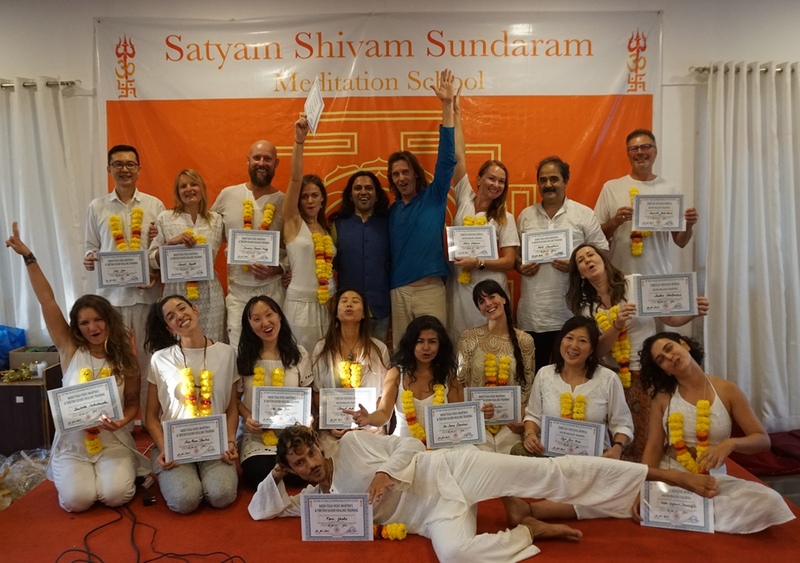 Satyam Shivam Sundaram Sound healing therapy & meditation teacher training center in located in heart Rishikesh city behind parmarth Niketan Ashram, Near Ram Jhula, Rishikesh. our centre is surrounded by the beautiful view of the Himalayas near ganga river very close to Vam prast ashram and Just 5 minutes walking from river Ganges. Sacred Sound Healing Training Through Tibetan Singing Bowls Therapy – Mantras & Sacred Sound Healing Meditations Techniques. Accommodation for 5 nights with Private Room with Double Bed and attached bathroom with hot water Shower (Single Occupancy only) Extra night room accommodation charges extra. Every day morning healthy breakfast & lunch. Saturday 6th April until Tuesday 9th April 2019. Regular Residential Course Price For (Double Occupancy Shared Room) In Deluxe A/C Room : €550 Euros – Next 3 Early Birds Discount 125€ Euros. Regular Residential Course Price For Single Occupancy In Deluxe A/C Room : €650 Euros – Next 3 Early Birds Discount 125€ Euros. Non-Residential Course Price: €400 Euros – Next 3 Early Birds Discount 100€ Euros. What’s Included in Training: A/C Well Furnished Meditation Hall, Accommodation for 5 nights with Private Room with Double Bed and attached bathroom with hot water Shower, Extra night room accommodation charges extra. Every day morning healthy breakfast & lunch. Regular Residential Course Price For Double Occupancy In Deluxe A/C Room : €550 Euros – Next 3 Early Birds Discount 125€ Euros. if you have any questions feel free to message us on whatsapp +917888206883.